Thank you all for your kind comments on my wedding announcement. 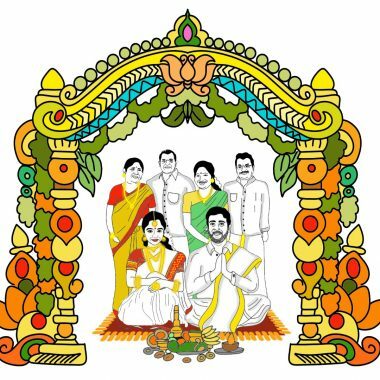 Yes, I will be sharing all the details of every wedding ritual we take part in. My most favorite time so far in the wedding preparation, apart from spending time with my family, has been wedding shopping. Within a week of visiting India, I had to finish my wedding saree shopping in order to give my tailor ample time to stitch the blouses. 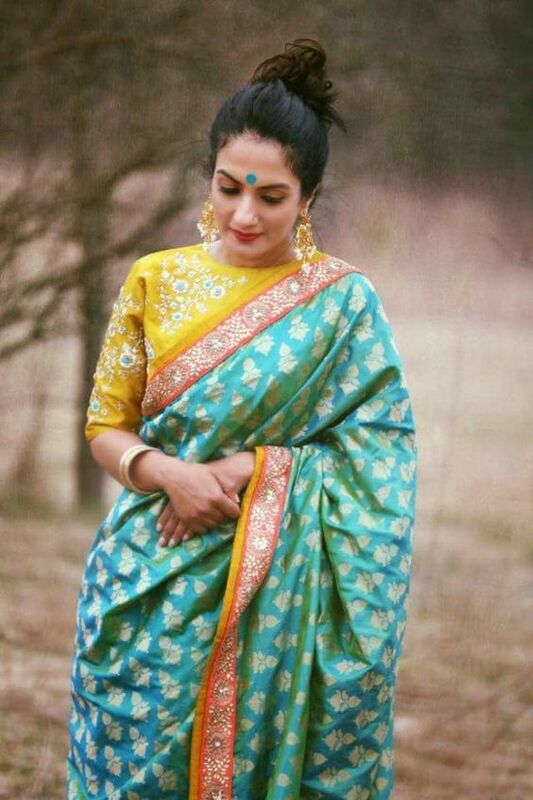 I had no clue on what was trending in the saree world. The only thing I was aware of was the traditional colors I should be considering for my wedding day like red, green and off-white. 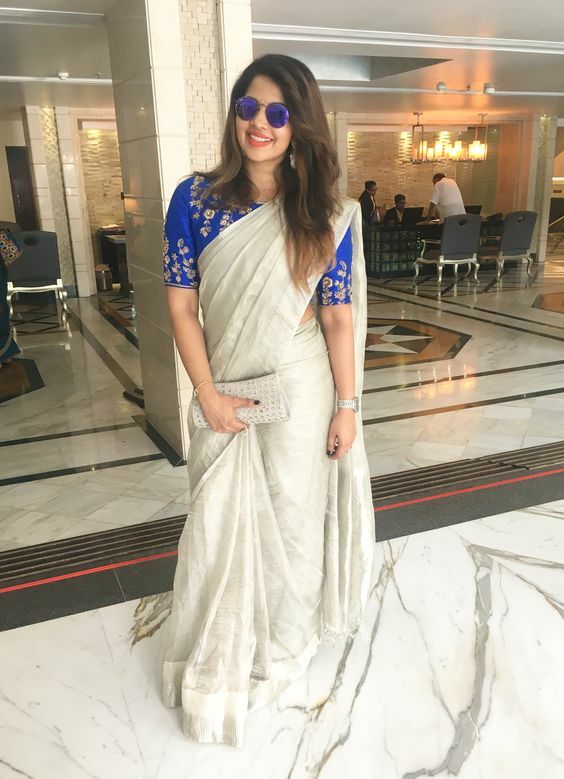 While shopping for my own wedding sarees, I picked up a few saree trends that I have seen consistently at every store we went. 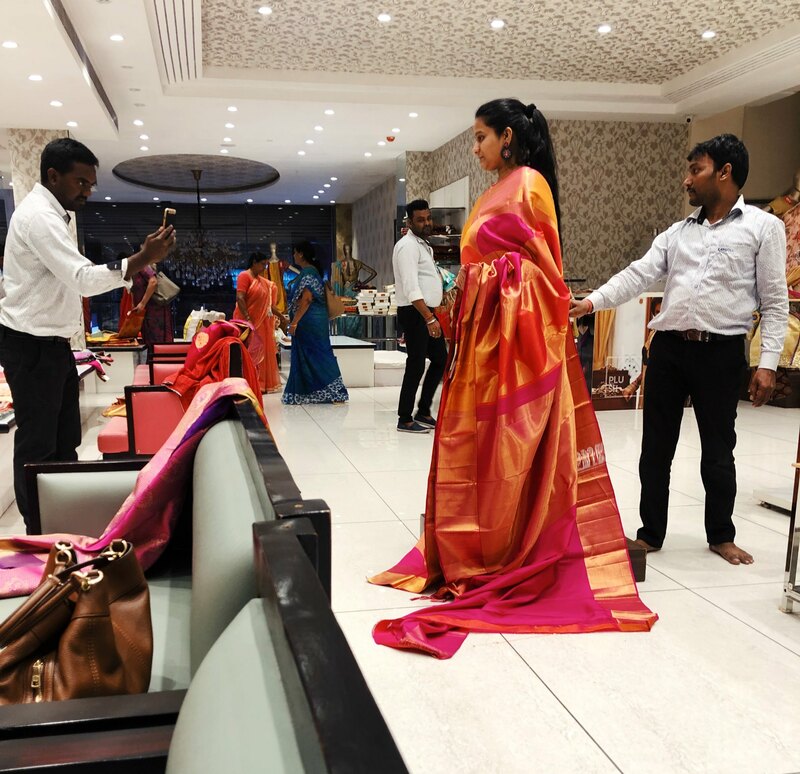 If you’re a bride-to-be (like me :)) or a close relative or friend of a bride-to-be, and are in the process of hunting down the outfit but don’t know where to begin, this post covers all the South Indian wedding saree styles and trends. 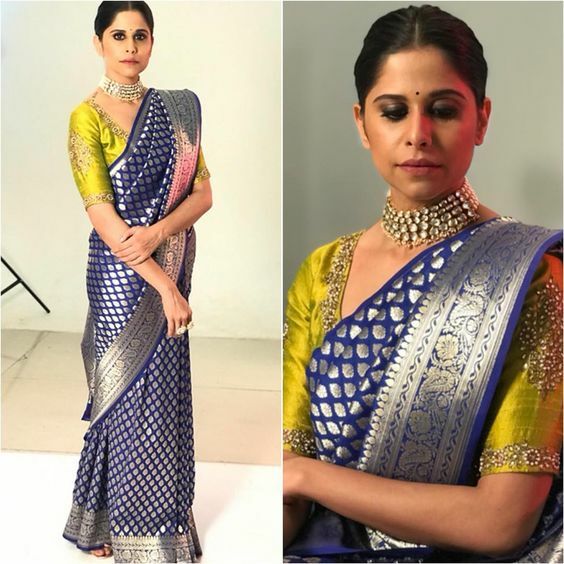 Whether you opt for a low-key ceremony or a big fat Indian wedding you can find these wedding saree trends in every budget. 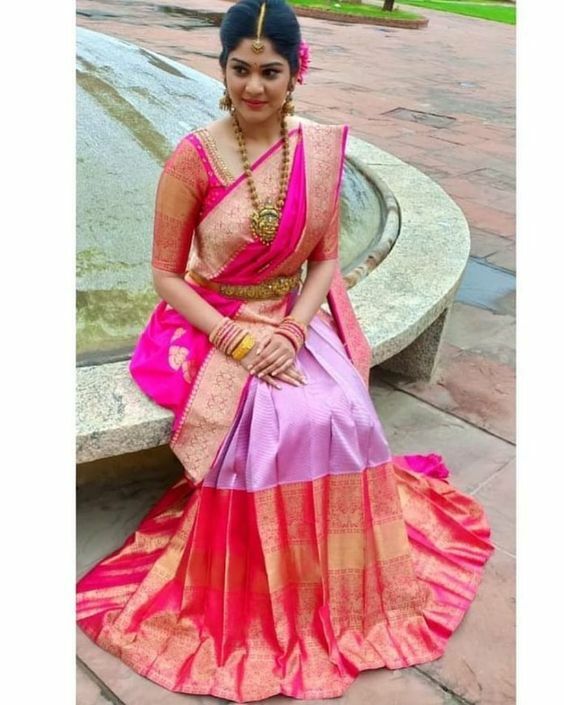 Kanjeevaram saree is the most preferred sarees for any event in South India. 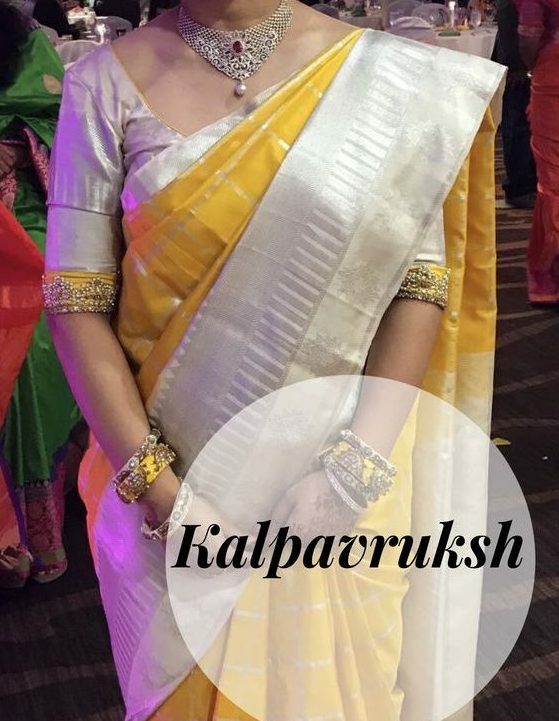 Vibrant colorful hues and zari border on these sarees make everyone look elegant and beautiful. 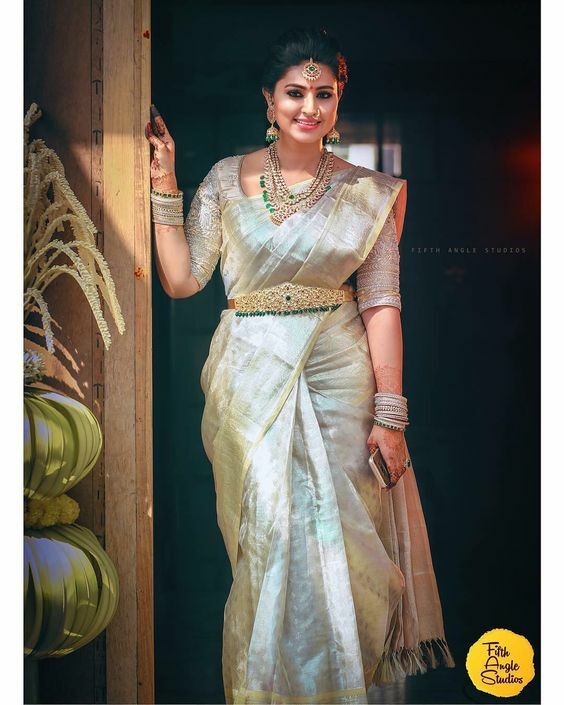 The Big and heavy border Kanjeevaram saree is considered more opulent in recent times. 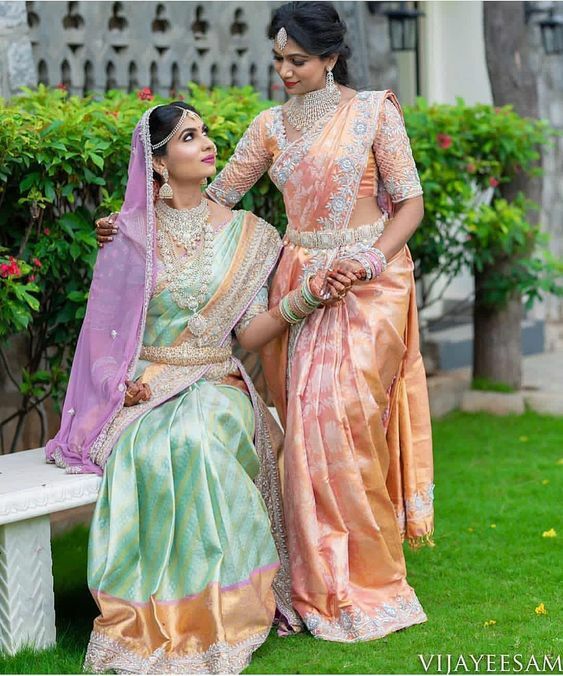 The Subtle hues started off as a sangeet and wedding guest choice now being experimented by brides itself. The colors are perfect for a spring and summer wedding. They go well with all kind of jewelry from gold, silver, pearls, beads, and diamonds. 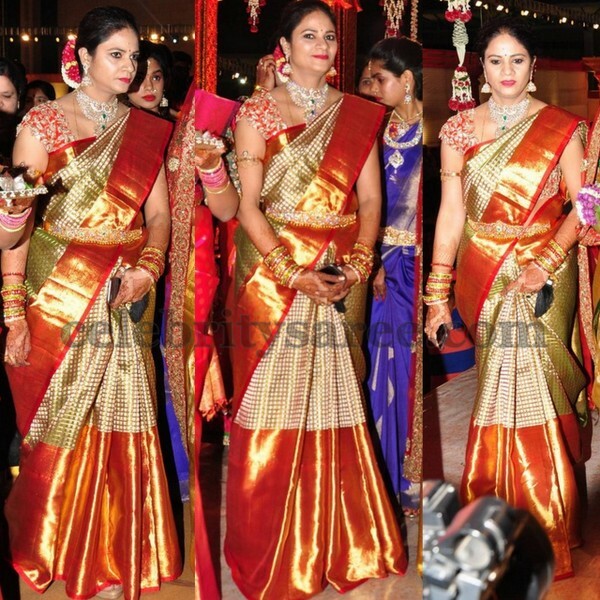 Gold Kanjeevaram sarees is one of the most chosen sarees by a south Indian bride. Recently, all metallic shades -gold, silver, copper, rose gold or a combination of metal shades have been trending. 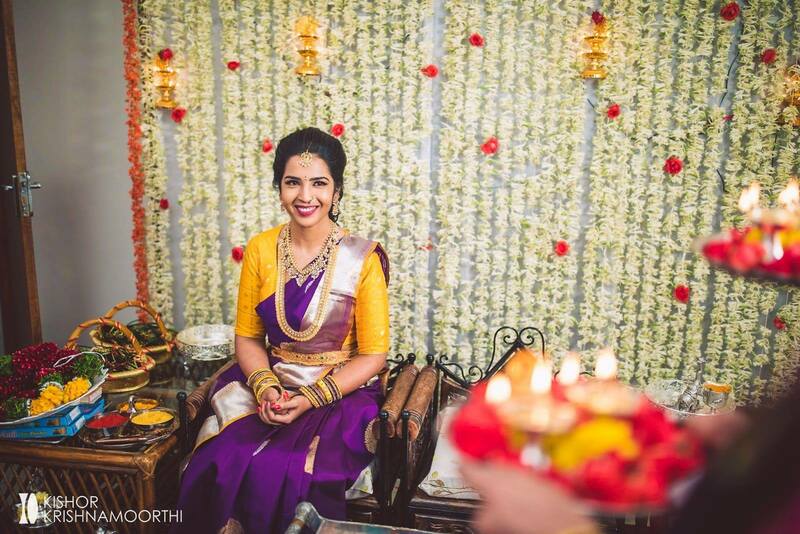 Uppada tissue saree and Linen saree in metallic shades have become the “it” saree choice for wedding guests recently. Silver motifs and silver borders look as opulent as gold zari borders. If you are an experimental type bride, I highly recommend getting on this trend. 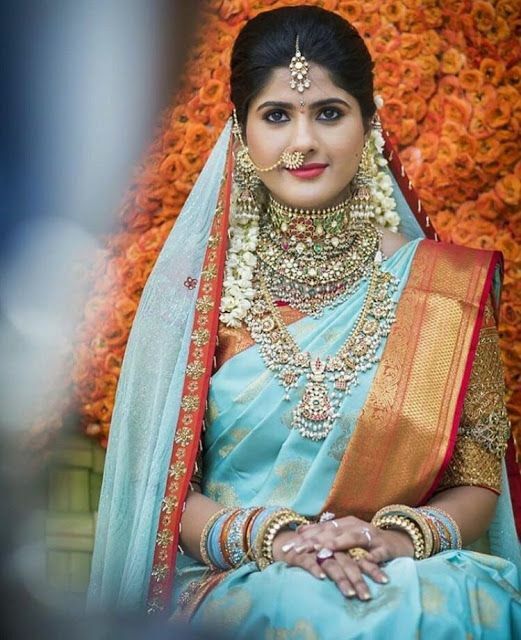 Surprisingly, the silver border sarees also look great with gold and diamond jewelry. 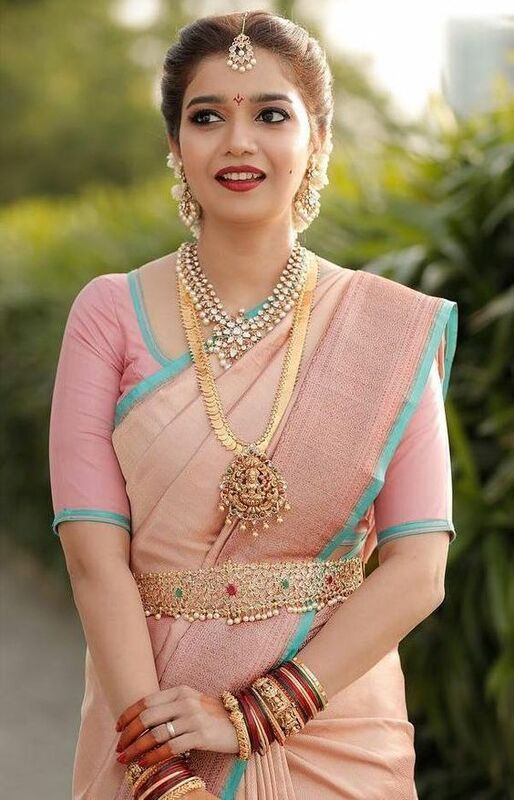 These sarees will also make an amazing choice for female relatives and wedding guests. 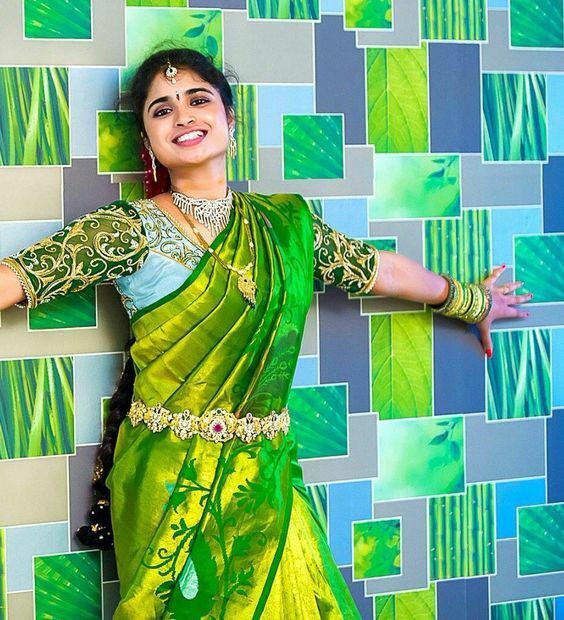 Green is the second most preferred color in Indian weddings after red. 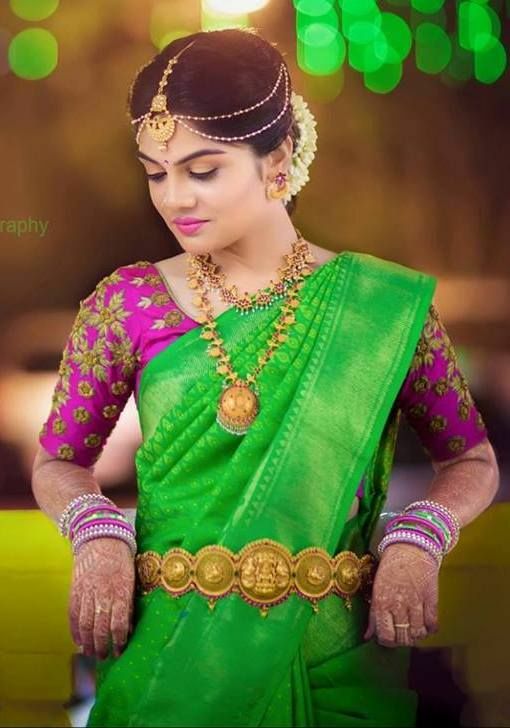 But what’s special is the various shades of green- light, dark, teal, fluorescent, you will find sarees in all shades of green now. 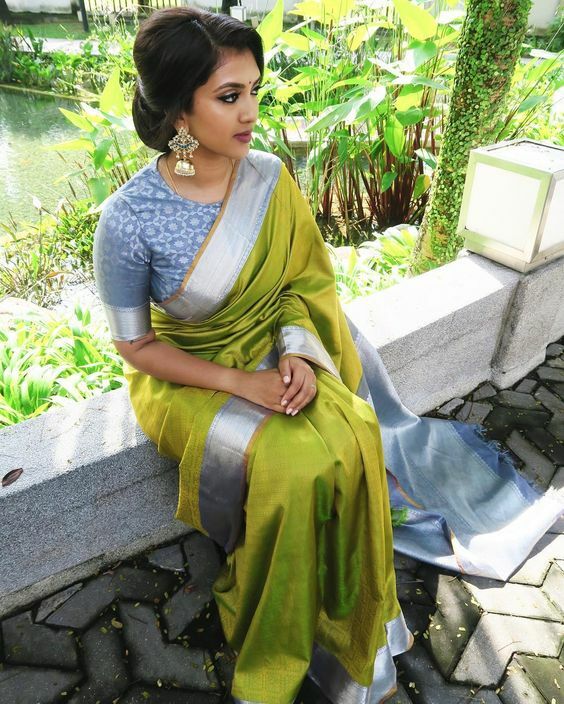 For extra oomph, wear a solid green saree with a contrast blouse. 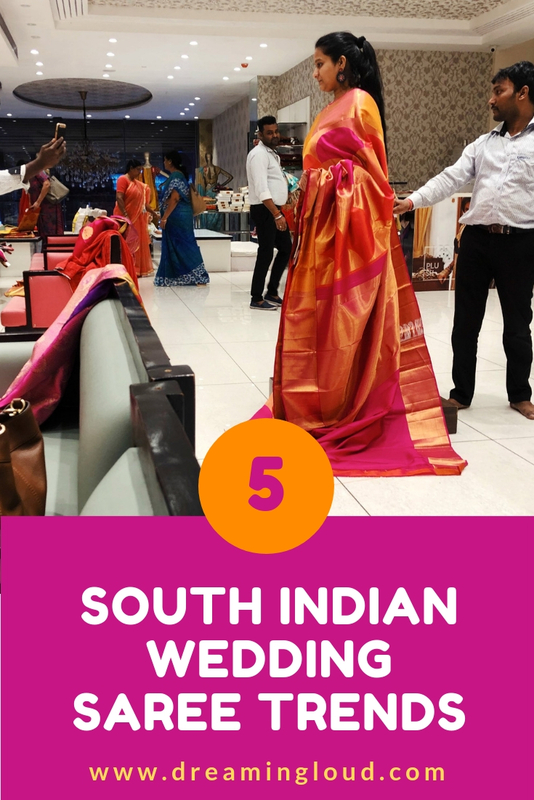 Hope this post featuring the top South Indian wedding saree trends helps you to get started with your wedding shopping! The above pic is from my wedding shopping day. 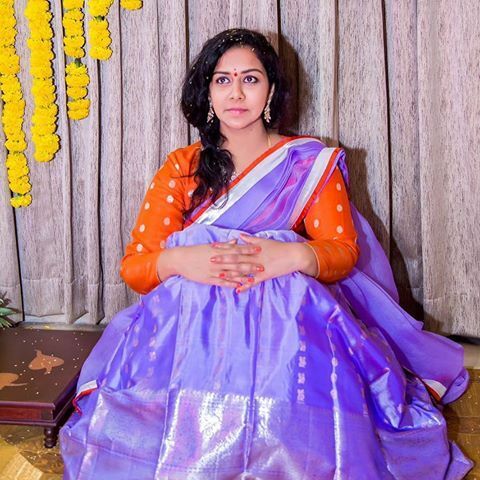 It was truly my princess moment where everyone is trying to find my “THE” saree. However, finding something that will satisfy everyone, my parents, my in-laws to be and I was the most challenging part. 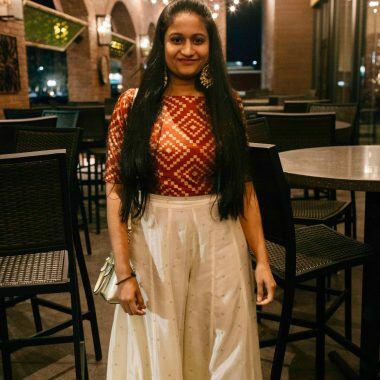 Let me know in the comments what other wedding posts you’d like to read. I would love your feedback!